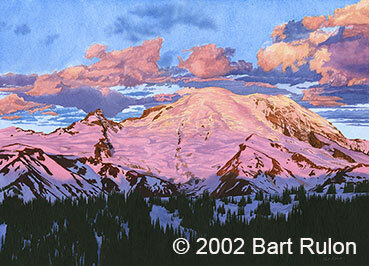 This painting depicts a magical moment I experienced at Mount Rainier National Park at sunrise from a location called Sunrise. I'm not much for waking up early, especially when its really cold out, but it was well worth the effort to see the sunrise light up the mountain in pink and gold. This painting is featured on the cover, and as a step by step demonstration in my book "Artist's Photo Reference: Water & Skies"